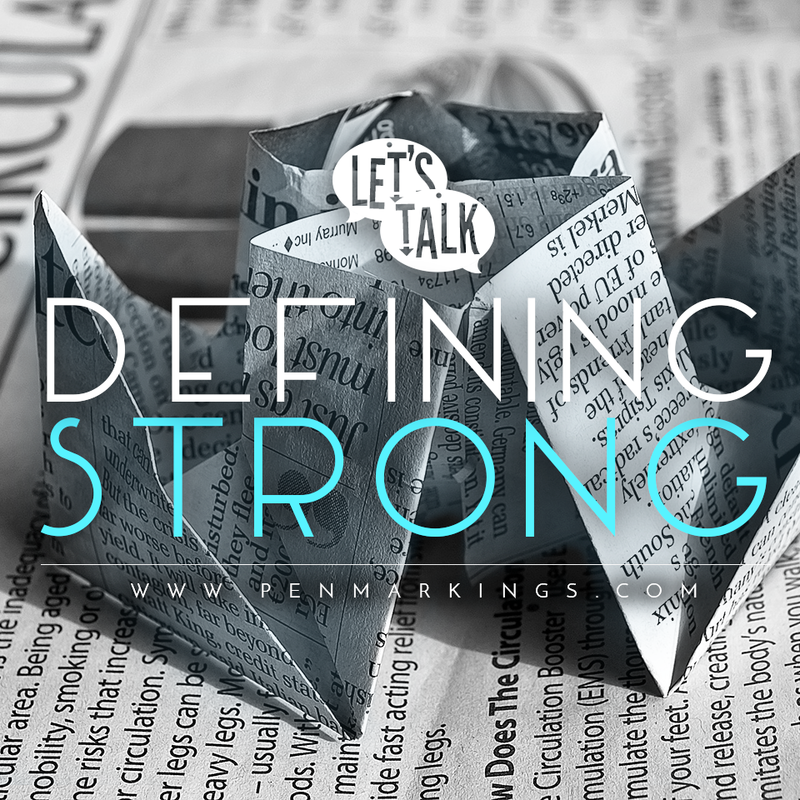 Let’s take a moment and define strong, shall we? 1. Having the power to move heavy weights or perform other physically demanding tasks. 2. Able to withstand great force or pressure. … and those are definitely good meanings. Pretty spot-on. And this is evident when we say “strong heroes & heroines” we conjure up the image of fierce warriors, strong and brave in battle. But I want to talk a bit about a different kind of strong. Character warriors are certainly strong. They’re brave. They’re fierce. They’re tough, and they’re gutsy. They fell hundred of enemy soldiers and it’s their skill with a blade that helps them win the battle. They’re definitely awesome. But I’ll admit that when I read about characters like this, I feel a bit… alienated. I’m not an athlete. Sure, I do my fair share of distance running and I’m not a 100% couch potato (more like 75%) but I’m no track star either. And when I see all these characters, with their kickassery abilities in combat and how they can do flips and drop-kicks and can KO a grown man within a span of a single breath, it sort of makes me frustrated. Don’t get me wrong, I totally love the fact that we have such strong protagonists, especially with the heroines as we slowly break that “damsel-in-distress” mold and empower them, giving them the ability to save their own skins. But it seems like whenever you mention a strong protagonists, the majority of them are the kickass, sword-waving trouser-wearing badasses we see running around. I’m a logical kind of girl. Hermione and Kestrel are my spirit animals, and my idea of a workout is some nice mental problems instead of running the distance. And while I adore those warriors and their braveheart souls, it sort of leaves me wishing there were a bit more diversity in the definition of a strong character. Not every character needs to wield a weapon to be strong. They can be witty and clever, quick thinkers and strategists. They can be unyielding and brave, regardless of their skills. They can be sturdy and tough, able to bear the heaviest of burdens and still march ahead. They can be independent and willful, not breaking or bending or ever giving in. Strong can mean so many things to so many different people, and I’d like to see more characters encompass the different meanings. Strong of heart. Strong of will. Strong of mind. Strong of soul. Strong does not always equal strength. Strong can mean anything the reader wills it to be. So tell me. What does strong mean to you? I have always interpreted “strong character” as “well written and well rounded character that feels like a real person”. I never interpreted it as literally physically strong, or even mentally strong, so when I came across people who saw it that way I was kind of taken aback. I call a strong character strong in the same way a teacher will call a good essay a “strong essay”. It’s got nothing to do with either physical or mental strength for me, it’s purely about whether or not the character comes alive on the page.